Reviving khadi was not an easy task. It did not happen with a bang. It required focus and perseverance. Each stage was a learning experience. Experience of the first few years of Gandhi’s efforts to set up a khadi unit are described in three short chapters of his autobiography, ‘My Experiments With Truth’, The first of these, The Birth of Khadi, describes how he was effectively starting from a blank. He had not actually seen a spinning wheel in 1908 when he described it as a ‘panacea for the growing pauperism’. He probably hadn’t seem a hand loom either. He was not alone. Khadi was virtually unknown in 1917. Yet, within a few years it became a powerful symbol of India’s freedom struggle. And a symbol of simplicity and nonviolence. In this blog we recount the early experience till about 1920. Gandhi’s life can be described as an experiment. The narrative of reviving khadi vividly demonstrate the power of three E’s – Evidence, Experiment and Experience. Gandhi and his colleagues moved to Sabarmati Ashram on the outskirts of Ahmadabad in June 1917, determined to cloth themselves with clothe manufactured by our own hands. The first step was to set up looms. that proved to be relatively easy. But learning how to weave wasn’t. Traditional weavers were jealously guarding their secrets. Gandhi’s nephew, Maganlal, who had been a part of Gandhi’s struggle in South Africa had ‘a natural talent for mechanics’. He picked up from what a weaver was willing to teach, became a master weaver himself and trained others. to begin with, the ashram community couldn’t weave enough for its needs. They had to reply on traditional weavers. This brought them in closer contact with weavers. The experience was an eye opener. They learnt first hand about ‘the condition of life among the weavers, the extent of their production, the handicaps in the way of their obtaining their yarn supply, the way in which they were being made victims of fraud, and lastly, their ever-growing indebtedness’. The weavers were reluctant to weave with yarn made in Indian mills. They were used to weaving with fine yarn which Indian mills couldn’t provide. With some persuasion some weavers agreed to weave with Indian yarn on the condition that the ashram would buy it all. Contact with mills gave Gandhi and his colleagues an insight into ‘their management and their handicaps’. The next step was to find a way of spinning their own yarn. It took perseverance. It was Found At last! as Gandhi proclaims in his autobiography by Gangabehn Mazumdar, a bold women who defied the social norms of her time. She enthusiastically went around the Baroda State in search for a spinning wheel. She found them in Vijapur. Several homes had spinning wheels which ‘had long since consigned’ to the lofts as useless lumber. Women of Vijapur were willing to spin if they had a ready market for the yarn. Finding the slivers for spinning wasn’t that easy. A textile mill owner came to their rescue. It was a stop gap solution. Not appropriate for the long term if they wanted to be independent of textile mills. Learning to card cotton and make slivers came next. Gangabehn found weavers willing to weave the Vijapur yarn and soon ‘Vijapur khadi gained a name for itself’. Gangaben had no formal education. But she had instinct. She sensed the moment right. It started small, with a few women. She motivated each one, giving them a vision of not just themselves, but of independent India. Silently she put in her energy, her heart and her own money. 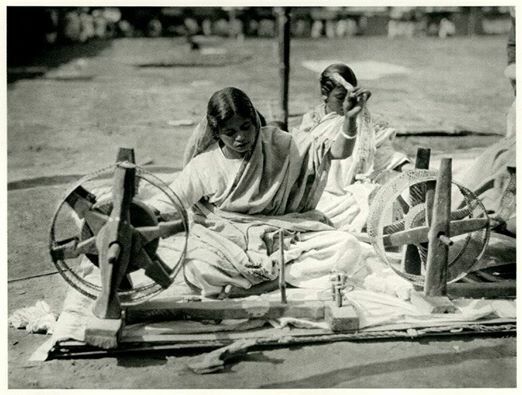 Soon by July 1918, some 300 women had started spinning of 100 wheels. Then she got 30 weavers to join in. Carding, Slivering, Spinning and Weaving. There was a huge revival of homegrown textile underway in Vijapur. By 1921, Gangaben had 2000 spinning wheels at the centre. Reviving khadi was no longer just a dream. The ashram community learnt spinning from Vijapur. They then became teachers. Soon spinning became an integral part of ashram life. Gandhi’s faith was not misplaced. Reviving khadi soon became a national mission. Khadi, in tandem with nonviolent campaigns, became a force to recon with. Post British rule it became a symbol of autonomy. More about that in future blogs.